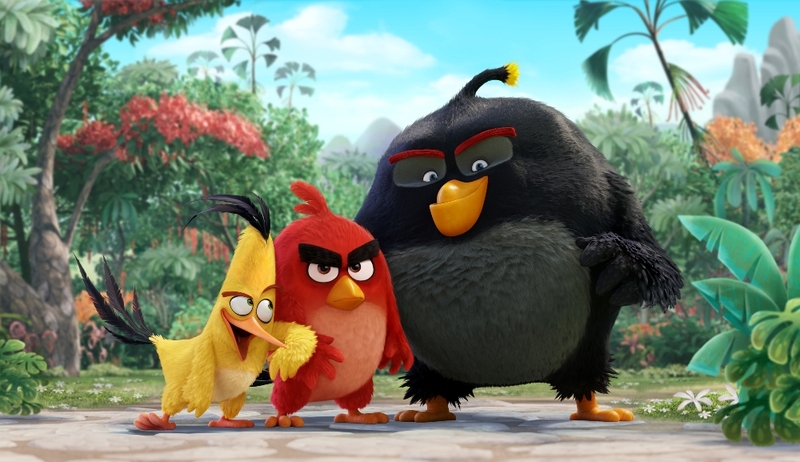 Angry Birds Movie Review - Lack Of App Story Translates As Expected - Are You Screening? It’s hard to deny that Angry Birds offers up some good-natured fun, especially for those of the appropriate age, but using an utter lack of story as a jumping off point is a bit of a hurdle. Adding to the difficulties, while films these days frequently include the odd bit that makes more sense once you discover its inclusion facilitates some aspect of the video game, this one has to work the other way, “explaining” why it is that some birds can explode (and still be there), fly like a boomerang, move incredibly fast, etc. The film does not actually explain any of these things, by the way, but it says them at you, so it’s covered. The story takes place on an island populated by flightless birds, and while the vast majority of the population is content with a society built upon the foundation of blind contentment at any cost, Red (Jason Sudeikis) is an angry bird. We enter with Red tearing through the jungle on his way to a gig as a children’s party clown. He runs into something of a problem customer (depending on your point of view), and when Red loses his temper, with unhappy results, he is sentenced by Judge Peckinpah to anger management, which is run by Matilda (Maya Rudolph). There he meets Chuck (Josh Gad), Bomb (Danny McBride), and Terence (Sean Penn). It’s a surprisingly solid entrance, but only because the film lays out exactly what it wants your expectations to be. A perfected microcosm of the film as a whole, the opening twenty minutes not only showcases the kind of gags you’ll be getting, but paves the way for the random patchwork of storytelling. 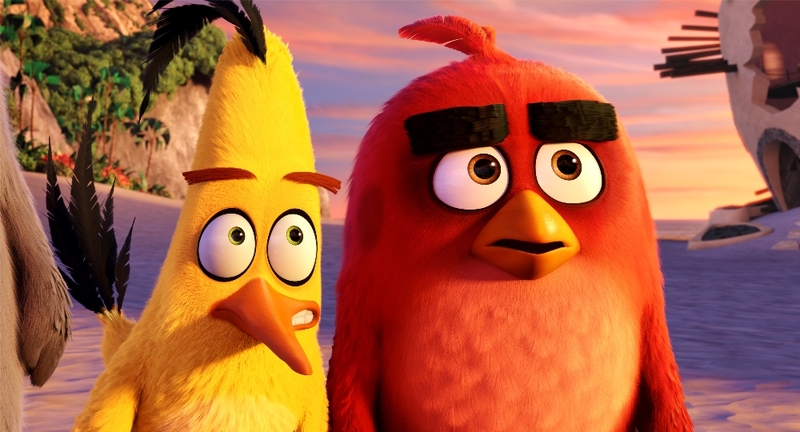 You might write off a lack of depth and complexity when watching an animated film, though the last decade or so has shown we should probably expect more, not less, but Angry Birds stretches the limits of convenience writing. There are a lot of things that need to pop up in an adaptation like this, but this one is constructed unapologetically with an, “I don’t know… there, it popped up,” theory of construction. Here’s a fast guy. Here, this guy explodes. We need to highlight anger, so in a societal system that is otherwise devoid of careers, we’re going to need an anger management counselor, a judge, and… let me see, party clown? Yeah, the really angry party clown is funny. And a slingshot. Draw me a slingshot. Beyond the obligatory construction pieces, the film plays out with the framework of dozens of other films mashed together into something that can culminate in teetering pig houses being smashed by flying birds. We’ve got a living legend who turns out not to be that impressive once we look behind the curtain, a misfit/outsider/child no one will listen to, much to their peril, Greek’s bearing gifts, and several others. While our heroes manage to deliver on charm, mostly because Sudeikis, Rudolph, and Gad would be hard-pressed to avoid charming you in any situation, it isn’t enough to overcome a goofy story that can’t pull you in, especially when there is little to laugh at here. It feels lazy more than anything else, becomes tiring by the time you’re halfway through, and it radiates with an odd air of being created by people who believed that, “Well, what did you expect?” would actually be a bit difficult to counter in these circumstances. It may have a few moments, and the youngest audience members will mostly enjoy it, but even they will find it forgettable at best. You can't really blame anyone for taking a shot at a cash grab based on the App's popularity, but this one ends up an odd "no story in, no story out" effort.